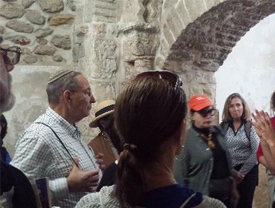 AFSI prides itself on showing its Chizuk participants the REAL ISRAEL. Although we have been leading these semi-annual trips for the past 22 years, nothing gets stale. As Israel grows and develops – as it creates roads, bridges, tunnels, light rails, trains, and the means to crisscross the country, engaging the extraordinary diversity of the landscape, so we embrace the land and its people. We re-visit people and places and discover new ones. Everywhere we go, bonds are created that become so strong that we are pulled back again and again. 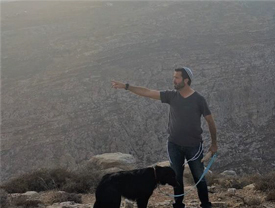 We are grateful to Israel and its people for preserving this Land for us to explore. November 7, 2017 was the beginning of the fall AFSI Chizuk mission. A beautiful view of the Mediterranean greeted the mission participants as we made our first stop in Palmachim. 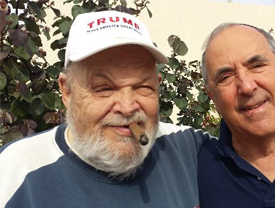 Having met at Ben Gurion just a short time before, greeting old friends and meeting new ones, our driver, Ami, brought us to this first destination. 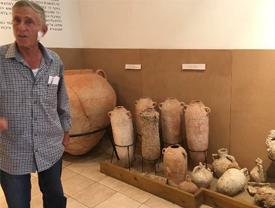 Moti met us as we disembarked the van, and after enjoying the lovely lunch set out for us, we were treated to a tour of Beit Miriam, a wonderful archaeological museum filled with local treasures. We enjoyed seeing the synagogue under construction, a sign of the special cooperation between the kibbutzniks and the Gush Katif refugees from Eli Sinai who have made Palmachim their new home. 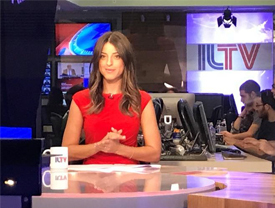 Driving through the narrow streets of Tel Aviv, we arrived at ILTV, the TV station which was celebrating its second birthday. 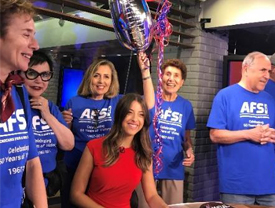 Dressed in our AFSI t-shirts, we surrounded Natasha, the anchor for the show, carrying balloons and singing happy birthday to this important news of Israel outlet. 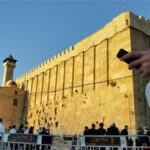 Afterward, we headed to Yerushalayim for our three-night stay at the Dan Panorama. 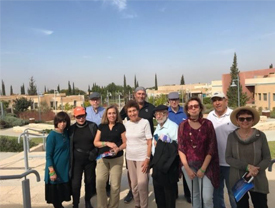 Wednesday, Nov. 8, began early as we went to the Temple Mount for our 7:30 AM meeting with Rabbi Yaakov Hayman, head of the Temple Mount Heritage Foundation. As usual, our group had to submit passports and wait for the heavy Israeli police guard that accompanies us on every tour of Har HaBayit. It was a beautiful day, so we patiently waited to be admitted, enjoying the sunshine and the view of the Kotel below us. 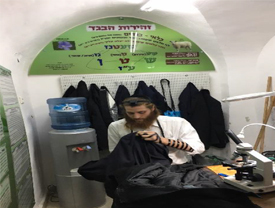 Yaakov gave us a wonderful tour, as always, and the feeling of holiness and spirituality that permeates the Mount was not diminished by the prodding of the police or the glares of the WAQF guards who followed our progress. 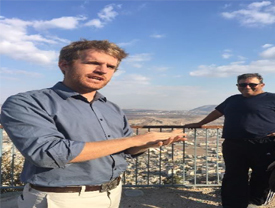 Dan Luria, Executive Director of Ateret Cohanim, met us at the conclusion of our Har HaBayit tour and guided us through the Old City. We stopped at a tiny store newly opened in the Muslim Quarter that houses a Jewish enterprise dealing with shatnes. This stop was a MUST as the store is owned by David Wiseman of Dallas and arranged by Arieh King. Racing up and down the stairs of the Old City, and climbing to rooftops for fantastic views of Yerushalayim, are all part of touring with Dan. We love it. 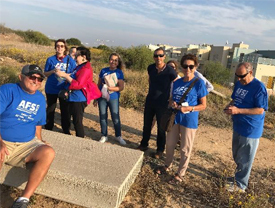 After a quick lunch in the Jewish Quarter, we boarded our van and traveled on to the Judean desert for a visit with Jeremy Gimpel of the Land of Israel Network. This was an extraordinary experience. Jeremy showed us the vast expanse of land, the building he and his team have constructed, and the plans in progress for a desert retreat. We were caught up in his energy and enthusiasm and agreed that this was a place to which we would have to return. Dinner that night was at Roza, in Gush Etzion. It has become a favorite of ours. 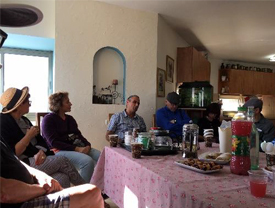 Thursday, Nov. 9, began with traveling to Eli in the Shomron for a visit with Gilad Ach and his Ad Kan team. We were told remarkable stories of how Ad Kan infiltrates Arab terror cells and exposes them. Using power point and personal anecdotes, we learned about the amazing work of this group. 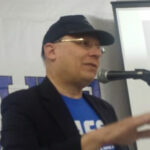 Once again, it was Aharon Pulver, of the Israel Independence Fund, who led us to this fascinating experience. 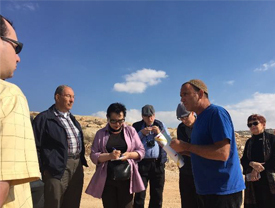 Remembering our Amona friends and their tragic expulsion from their homes, who are still living in dormitories in Ofra, we met Elad Ziv at their new construction site at Amichai, outside of Shilo. Happily, we can report that progress is being made on the infrastructure and the community is hoping to be in their new caravans by March 2018. We then drove on to Har Gerizim for our meeting with Caleb Waller, whose father, Tommy, had started a very active Christian HaYovel project in the Shomron. Looking down from the Mt. 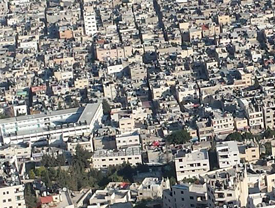 to Shechem/Nablus, one sees a postage stamp of the congested Balata refugee camp, surrounded by the sprawling, wealthy city. Clearly, the refugees are kept there for PR purposes. They could easily be absorbed into the city. We went on to Har Bracha with Caleb and met his twin brother, Joshua at their headquarters there. We enjoyed a stimulating talk about their pioneering work in Israel, and then said farewell and returned to Jerusalem. Dinner that night was at the lovely Piccolino restaurant. Arieh King, Councilman of Jerusalem, joined us for an always stimulating talk. There is much debate in Israel about the situation in Jerusalem with the arrival of thousands of Arabs within the borders of the Municipality. There are those who fear the Arabs will become a large enough majority so that the possibility of a Muslim mayor might exist. Arieh is totally devoted to Jerusalem and is strongly against moving any borders that would shrink Jerusalem in size. Instead, he wants to expand the borders so that the outlying neighborhoods of Jerusalem would be incorporated into a greater Yerushalayim. We support this plan. 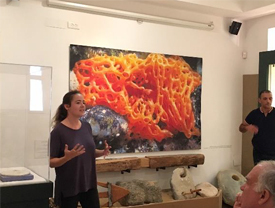 Friday, Nov. 10, began with an inspiring visit to Oz V’Gaon in Gush Etzion. 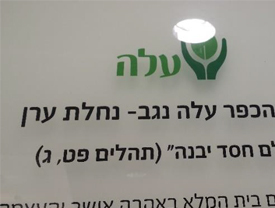 This park, dedicated to the three boys killed in the area, Gilad, Eyal and Naftali, has been amazingly developed by Nadia Matar and Yehudit Katzover, along with a large team of volunteers. AFSI has been a supporter of the park from the beginning. We were welcomed warmly. Judy Kadish and I offered greetings from AFSI. Ken Abramowitz, AFSI Board member, was the keynote speaker, once again teaching us about how to save Western civilization. 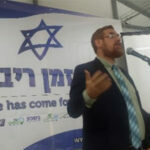 MK Yehuda Glick and MK Uri Ariel also spoke, concentrating on support for Sovereignty – the key effort of the Women in Green. We walked the new Zionism path in Oz V’Gaon, with signposts on either side, containing quotes from great Zionist leaders. This was a great way to mark the 120 years since the first Zionist Congress and 50 years since the liberation of Gush Etzion. We left reluctantly, promising to promote Sovereignty wherever and whenever possible. Our next stop was Netiv Avot in Elazar. In the tradition of AFSI, to give Chizuk to threatened areas, we knew that a visit to the community was a must. The spokesman told us the tragic story of the decision by the Israeli Supreme Court to demolish their homes despite the fact that NO proof exists that their homes violate any true Arab entitlement. Once again, the Court sides with Arab claims over Jewish rights. We are praying that reason will prevail and the decision to destroy will be cancelled. We drove on to Kiryat Arba/Hebron to settle into our Yeshivat Nir dormitory accommodations. Again, the weather was gorgeous, and walking down the hill to Hebron with thousands of Yeshiva students and families, was a great pleasure. 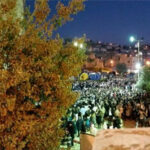 Hebron was packed with 35,000 visitors, most camping out and enjoying the festive atmosphere. 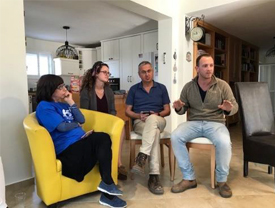 After Kabbalat Shabbat services, we walked to the home of Ora and David Wilder in Beit Hadassah, where the entire group had been invited for dinner. It was a wonderfully festive meal, with prayers, songs, good conversation and delicious food. Shabbat morning we returned to Hebron for prayers at the Ma’arat HaMachpela, crowding into the Yitzchak hall which is open to Jews only a few times a year. Minyans were formed everywhere in the plaza and pup tents crowded every available space. Huge tents had been set up to feed the thousands with beautifully catered meals. We had Shabbat lunch with the Hebron Fund, a group we’ve enjoyed being with on past Chaye Sarah weekends. 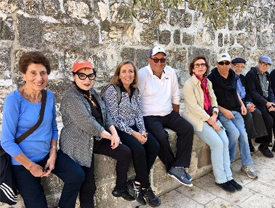 The afternoon was filled with tours to Tel Rumeida, the Avraham Avinu neighborhood, and simply walking along the main street meeting old friends and enjoying the camaraderie of the day. 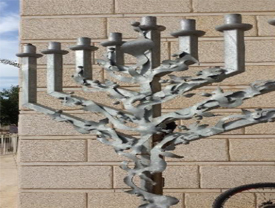 Shalosh Seudot and Havdalah took place at the Gutnick Center. 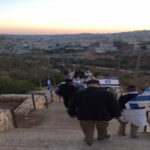 Shabbat was over and the exodus from Hebron began. The traffic was so congested that the police had to close entry completely. 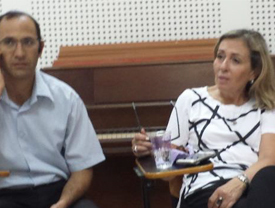 That gave us time to visit dear friends from the past, Yifat and Shalom Akobi. They are living in Beit Machpela, a reclaimed building in the heart of Hebron. Yifat took us to the roof of the building for a spectacular view of Hebron. It was an unforgettable sight on that beautiful night. 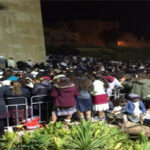 After returning to the Yeshiva, we packed up and drove to Arad for overnight. Unfortunately, we didn’t have time to explore the city, which has many fascinating aspects to it. 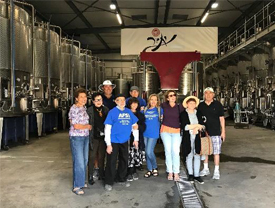 Instead, we met Shulamit of the Har Hebron community and she guided us to our first stop – the Yatir winery. We had a fascinating tour of the winery, led by Etti Edri, the Assistant Manager. 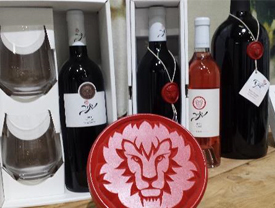 We enjoyed tasting some prize winning wines. We drove on to Sussya where we gathered in a private home to hear about life in that community. We also met with Arye Odess, who told us of his transition from Gush Katif to Har Hebron. 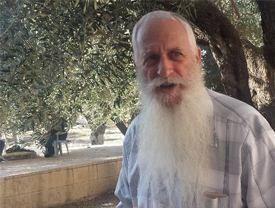 His nephew, Elisha Odess, is still in prison on false charges of participating in a “price- tag? arson attack in Duma. There is no evidence against him, but he continues to be held in solitary confinement. We believe this is an abomination. An unusual and delightful lunch stop was at Café Ron’El in Mitzpe Yair. 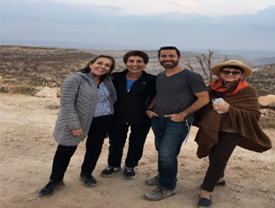 In addition to enjoying the wonderful home-made food while eating outdoors with a group of soldiers, overlooking the Hebron hills, we heard Ron’el’s story of her conversion to Judaism and her decision to live in one of the 18 communities that make up Har Hebron. Arabs surround these communities, so co- existence is primary. 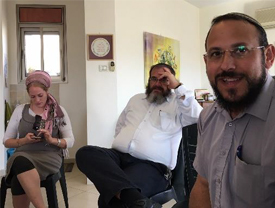 Rabbi Aaron Egeltqal had arranged the meeting for us and he was there to fill in the blanks about the area. 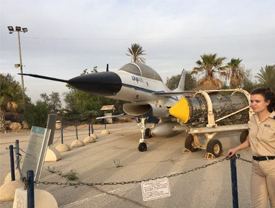 The afternoon was spent at the Israel Air Force museum in Hatserim, outside Beersheba. The tour was fascinating, instilling great pride in this branch of the military which has such an incredible history. One could not help but feel that despite the many warts we see in Israel, there is so much to celebrate. Driving on to Ashkelon, we arrived at the Holiday Inn where our rooms all faced the sea, providing fabulous views. 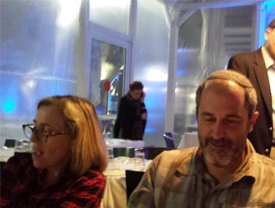 Dinner was at a new restaurant at the new dock in Ashkelon. We couldn’t help but marvel at the growth of the city, which has been expanded and been developed beautifully. 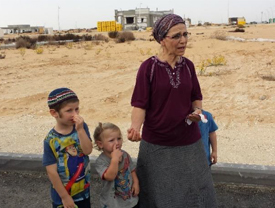 The Gush Katif refugees who built their permanent homes there, have created an outstanding community. Monday, Nov. 13, we made Sederot our first stop. 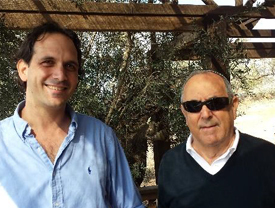 Although we always hope to visit with our good friend, Mayor Alon Davidi, it wasn’t possible this time so Elad Kalimi, the Deputy Mayor, met us and guided us around. The city, known for its hundreds of rocket attacks and the Tzeva Adom – the red alert – has become a garden spot. A huge playground attracts children and adults from the entire area. We climbed the hill that enables one to see Gaza very close by. It’s a sobering sight. 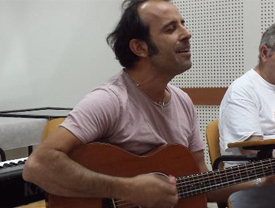 Knowing that Sederot is a music center, we asked to be taken to a studio where we met a delightful musician. He played and sang some of his original songs. We enjoyed the experience immensely. 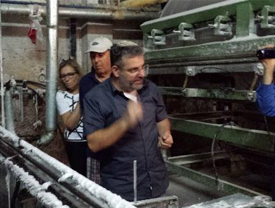 Then we moved on to the Menorah candle factory where we saw the intricacies and equipment involved in producing candles. Of course, purchasing our Chanukah candles was a must. Dror Vanunu, our longtime friend and representative of the Gush Katif communities, arranged our afternoon in Lachish. First we visited dear Gush Katif friends, Rachel and Moshe Saperstein in their beautiful new home in B’nai Dekalim. 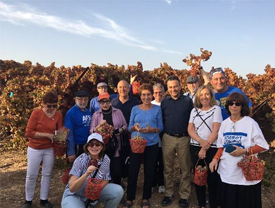 We then enjoyed picking grapes at a marvelous Lachish vineyard. Each of us filled our baskets to the top with delicious red seedless grapes, while eating some at the same time. 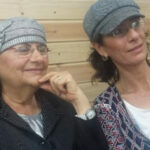 In Karmei Katif, we were shown the new synagogue under construction in memory of Tali Hatuel and her four daughters and unborn son, all murdered by terrorists in Gush Katif in 2004. 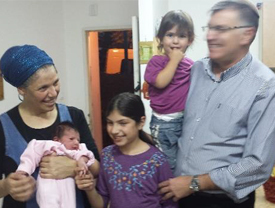 David Hatuel, his new wife and six children now live in Karmei Katif – in a caravan, but will be moving into their new home shortly. We visited the family in their home and were greeted with great warmth and joy. 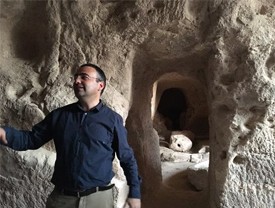 Before leaving the area, Dror took us into some amazing caves dating back to the Bar Kochba era. Awesome!! We returned to Ashkelon for dinner and packed up for our last day of the Mission. Another brilliantly warm, sunny day greeted us on Tuesday, Nov. 14. 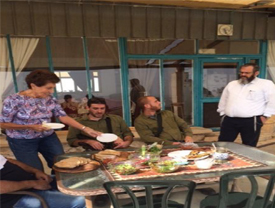 We began our touring at the Aleh Negev Nahalat Eran Rehabilitation Village. We had been to the Aleh facility in Yerushalayim and had seen the severely handicapped residents. 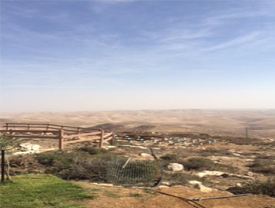 But here, in the Negev, with lots of land available, and a beautiful campus, the residents seemed to flourish. Being outdoors, integrating with a large staff, many volunteers, even prisoners who helped with the youngsters, the scene was much more uplifting. We continued on to the Halutza communities of Shlomit, Neve, and B’nai Netzarim. All three are on the Egyptian border and seem to be isolated on the sands. The residents, however, greeted us with smiles and stories of the wonderful life they enjoy. At B’nai Netzarim, we took pleasure in seeing the synagogue, dedicated by the Moskowitz family. We couldn’t help but recall the beautiful synagogue in the original Netzarim in Gush Katif which we had seen being built. We watched this one from the beginning also, and are so pleased that it is such a beautiful structure. 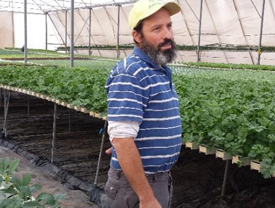 We also enjoyed being taken to a greenhouse, such as the ones we visited in Gush Katif, where many varieties of bug free lettuce were being grown. The hydrophonic plantings were so perfect that they looked like flowers. 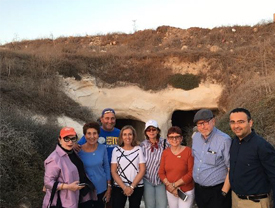 The drive to Ben Gurion airport, where farewells were exchanged, was filled with each participant speaking about the meaning of the trip to him/her. It was clear that each one saw himself as an Ambassador, equipped to describe the REAL ISRAEL to all who would listen. 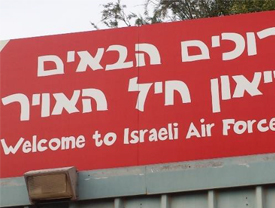 Many who were with us will return for the special Yom HaAtzmaut trip scheduled for April 17-25. 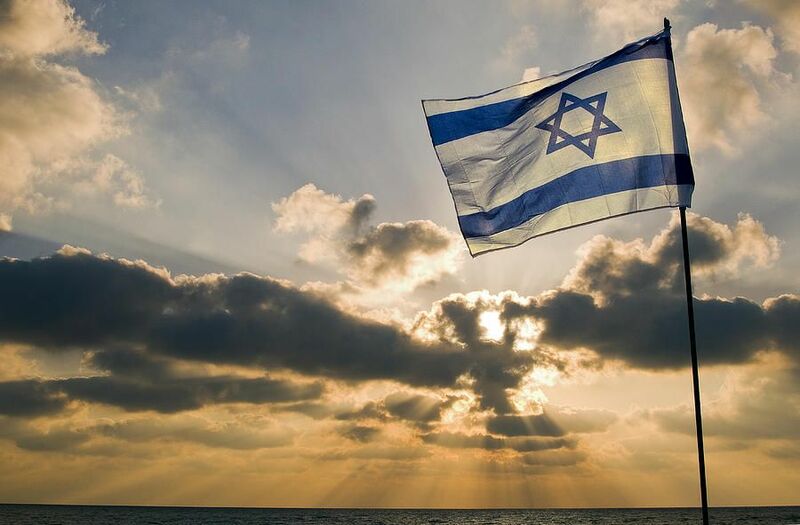 Others, who were not with us, have already reserved for this special time in Israeli history when the 70 years since the creation of the State will be celebrated. We look forward to it with great anticipation. All are invited to join us. Contact Judy at 212-828-2424 or write to judy@afsi.org. 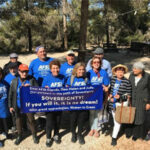 The AFSI, November 2017 Mission to Israel, was timed to celebrate the amazing, miraculous victories of the Six Day War of 1967 where Israel regained the Golan Heights, Judea and Samaria were restored, and Jerusalem was united. Israel was whole again. The speed with which the victories took place was unexpected and unprecedented. Israel had prepared 30,000 graves, in preparation for the worst. Instead, amidst the euphoria of victory was the bewilderment expressed by Israel’s PM Levi Eshkol – “What are we going to do with all of that?” It was that indecision and lack of preparedness for victory, which has led to the fifty years of “disputed” territories.